More progress to report at the food growing project at the local high school in Reepham. Teacher Matt Willer and his colleagues have started to broaden out the participation of students at the project, most recently extending this to a group focused on ‘Care of the Countryside’, who also carry out regular sessions at a local Field Study Centre. by all accounts this was a great success, with the students putting in a full shift to improve the recently dug soakaway. Another recent project has been to create a brick path using recycled bricks. It’s planned to fill in the gaps with some fine wood chippings. Matt is also interested in the possibility of offering qualifications in association with a local college – and maybe also seeing the wider, unused site developed for more ‘full blown’ agriculture…all very relevant for this School set in the heart of rural Norfolk. You may recall that I’ve become involved with a food growing project at the local high school in Reepham. ‘The Allotment Project’ is the brainchild of teacher Matt Willer who has put energy and ideas into action on a not very promising (very wet) plot at the back end of the School playing field. Matt and his colleagues have got an enthusiastic group of students working regularly during lunch breaks, including most recently a group working towards their Duke of Edinburgh Award. Matt kindly sent me an update which is very encouraging. You might recall that I suggested that they might like to sow a ‘green manure’ to give cover and eventually added nutrition, toa large raised bed and Matt says the mustard plants are growing really well (see below). Also, as you will see by the photographs, the Sixth Formers have done a great job at preparing the largest raised bed by using old bricks (donated by a parent who is a builder). Matt is also now thinking of following Sepp Holzer’s very interesting idea of a raised bed, usually referred to as ‘Hugelkultur’ (see below). I have never seen this in practice and it would be great to experiment with this permaculture-inspired approach to ‘no dig’ food growing. The base of the ‘hill bed’ being prepared? Another teacher at the School, Mr.Crick, and his construction group, have also joined in the project and built a compound around the well to make it a bit safer, more attractive and organised. You may recall in my earlier post on this project how Matt and the students have dug this well into which the playing field run off descends, and from here he plans to pump it into a large storage container from where it can be drawn off for irrigation. I also hear that the broad beans I helped the children to sow are on the way up! I’ve written a little about this Allotment Project before. Headed up by enthusiastic teacher Matt Willer, it provides pupils of all ages at Reepham High School and College with some extra curricular ‘outside classroom’ experience of growing food. I’ve offered to provide some help and the other day I spent an hour with them. A lot of older boys turned up and Matt set them to shifting bark across the surrounds to some raised beds. Matt had also brought in two old car tyres he’d found, and these were duly filled with soil ready for planting up; another example of Matt’s creative approach to recycling in the project. How many boys does it take to shift a pile of bark…. I was pleased to see some faces that I recognised from a few years ago, when I was providing help at nearby Cawston Primary School; it was good to see these youngsters had retained their interest in growing. It was also nice that they also recognised me! Another good thing was to see that Matt had taken my ideas of sowing some green manure on a couple of large raised beds, and that the mustard seeds had germinated and hopefully will go on to cover the ground and be ready to dig in early next spring. Apart from the many boys, some other teachers (one of whom I’d worked with on gardening at the school a couple of years ago) brought a group of girls down who are part of an extra curricuar group interested in science and technology. I worked with them to sow some broad beans in four raised beds, explaining why we sow now, the benefits of broad beans (apart from the delicious flavour) and we prepared the soil, measured out rows, sowed and labelled each row. We even had a few seeds left so that they could take a personal plant home in a pot and see how their’s grows in comparison with those put in at the Allotment. It was good fun and I look forward to my next session there. I’m pleased to share part of an article featuring a gardening project at my local High School, where I helped with an initial gardening group some years ago. This article, from Permaculture Magazine, decribes how Matt Willer has used ingenuity and ‘scroungeabilty’ to establish a thriving school allotment…to read the full article you need to subscribe to the magazine, which I’ve just done. It’s a great read! 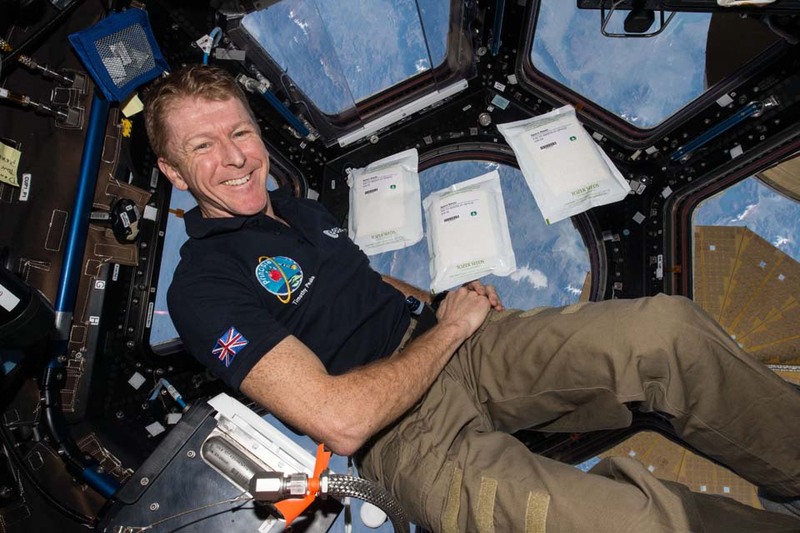 Today (18 April) British astronaut Tim Peake sent a special message from space to the hundreds of thousands of children who will be beginning our Rocket Science project in partnership with the UK Space Agency experiment this week. Tim, who delivered the message from the International Space Station where he’s been since December, wished the 600,000 young people signed up to the experiment good luck with their investigations into the impact of micro-gravity and space travel on seed germination and growth. The results will help to form a clearer picture of the potential for astronauts to grow their own food to sustain them on long-term missions. “This is a really exciting week for the hundreds of thousands of young people across the country who will begin their Rocket Science experiments. I’d like to wish everyone taking part the best of luck with their investigations and I look forward to seeing some of the results. With more than 8,600 schools and educational groups poised to begin their Rocket Science experiment this week, the project is now among the biggest mass science experiments conducted in UK schools. Rocket Science will see school pupils across the country spend 35 days analysing the growth and development of two batches of seemingly identical rocket seeds. However, one batch of seeds has spent time in space with Tim on the International Space Station, orbiting the Earth at 17,000mph. The aim of the experiment is to enthuse young people about science and horticulture and provide the European Space Agency with key insights into some of the challenges of growing food in space. Results of the experiment will be published later in the year but keep an eye on our website, Facebook page and Twitter page for updates! Looking back to my letter to you at this time last year, I see that various things were further ahead, especially in the ornamental garden and to some extent vegetables. But it’s still a lovely time of year, with fresh green growth everywhere and other emerging colours in flower and foliage. I was out weeding today and planting out some Cosmos, tobacco plants and ornamental grasses, just before the rain came to helpfully water them in. I finally got round to weeding (for the first time this year) an area at the front of the garden which was in danger of becoming overgrown with ground elder, nettles and the like- it was a relief to see it cleared and the strong growth of the shrubs and other plants there coming through, hopefully to invade the space that I’ve created. Whilst I was out a group stopped by the gate and were talking about the garden- after bidding them good morning they were very complimentary about the garden, which is always nice to hear. Elsewhere in the garden I’m just about up to speed on the food front. Broad beans are podding up nicely, I’ve some Calabrese, Cabbage and onions bulking up. The potatoes are up above ground (I’ll earth these up next week), and I’ve just put out some squash (interplanted with the onions) and Sweet Corn. 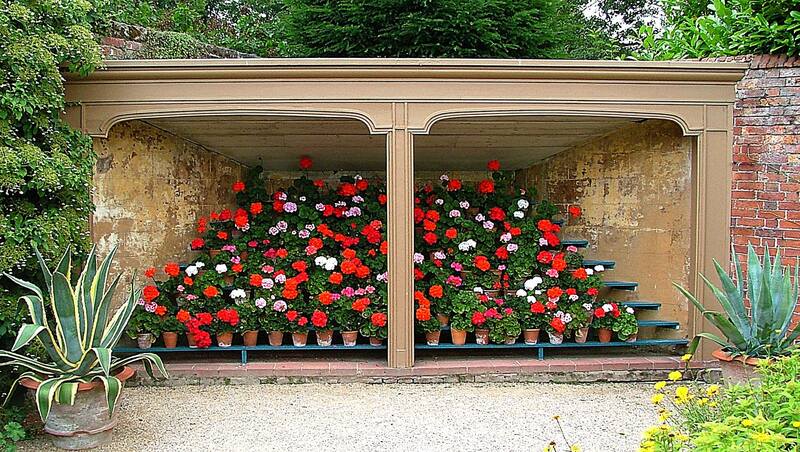 I don’t know if you watch the gardening programme ‘Beechwood Garden’ (shown early Sunday mornings on BBC 1), but they are trialling different approaches to growing tomatoes in a greenhouse. I was very interested to see the use of as specially designed ‘aquaponic’ system where the plants sit in pots with a wick in then that is dipped in a reservoir underneath in which you out the diluted feed. I’ve decided to buy the ‘Quadgrow’ system which I think is the one the TV programme is using, and can;t wait to get this set up next week. I’ve got 8 good looking tomato plants from my friend Steve to put in as well as the usual cucumber and peppers he’s kindly given me. So, Old School Garden, in spite of me being away for much of the month, seems to be shaping up nicely. Oh, I almost forgot, I finally cut back the Melianthus having had a couple fo flower spikes go over. It’s interesting seeing how small the new growth is compared to last year when I cut it back much earlier. I wonder if it will catch up! As I’ve been away a lot I haven’t been in to Gressenhall or Blickling much. you may have seen my post about my latest sessions at Blickling earlier in the week. I also spent a couple fo hours at Gressenhall, doing a bit of tidying up and planting out a few annuals in the gaps in one of the borders there as well as the entrance border, which I was pleased to see looking good, with purple Alliums contrasting well with the newly maroon red foliage of the Cotinus. The grasses in this border have done really well, in fact they might be in danger of unbalancing the design, so a bit of ‘editing’ might be required here. Well, as you read this we shall be back in Devon once more, hopefully finally sorting out a flat for my mother-in Law and getting some bulky items moved across so that she can move in once she’s out of hospital. Oh, and no doubt there’ll be a bit of lawn cutting and weeding to be done in her current garden, to prepare the way for selling the place. I do hope that you and Lise are enjoying the lovely Spring weather and managing to get out and enjoy your garden, especially now that you’ve got a gardener in to help you manage it. All the best for this month old friend. Here’s a link to a nice little film about this project which my Master Gardener friend Steve has helped to set up and develop. A great example of the generations working with each other. Steve has run many growing sessions that bring together old and young members of the community for their mutual benefit. He played a key role in establishing the Project in autumn 2011 with children from Catton Grove Primary School, older volunteers from Age UK, and staff from Mile Cross library, Norwich.